Today has been one of those days. Happy to be home, running errands with the kids and watching football. Yes, football. The season has yet to finish. Football season lasts like four hundred years. But that is a post for another time. I am still reveling in the wonderful behavior of my gorgeous daughter over the past two days. She had been hell for like the last two weeks, but it seems that once I changed my attitude, gave her time to adjust to being gone and then home again and I took a few deep breaths, she was fine. 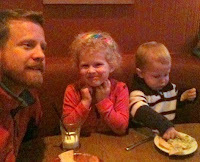 To celebrate or really to just avoid cooking, we took the kids to our FAVORITE Mexican restaurant in the city. 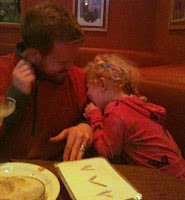 When I was pregnant with James, we ate there once a week and it was the first thing I requested after he was born. I wonder if this is why he was so angry for the first six months of his life? Hmmm, I will have to contemplate this as Tia Margarita's does nothing but make me happy! 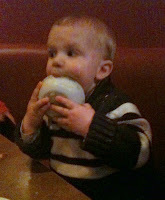 James had his first booster seat only dining experience. Personally, I thought I would die but he did well. Turns out give him a bowl full of guacamole, and he is right as rain! I was able to stuff my face and enjoy my wine while watching two of my favorite people laugh and love and create memories! The whole wonderful evening was followed by a miraculous "late" morning. Not only did James sleep until 6:45, which is unheard of these days, but Jeff let me stay in bed until 8:45. A perfect Saturday morning! This was all topped off by the children enjoying the very expensive and numerous gifts given to them over Christmas. We received boxes from Denver today which were full of toys and stuff and even more stuff. 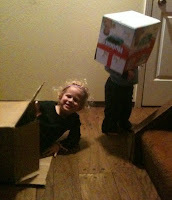 AND THIS IS WHAT THEY PLAYED WITH FOR OVER AN HOUR: a falling apart Macy's box and a Huggie's Wipes box. People, take note. My children are not hard to please. They take after their father! PS: All of these pictures are taken with my iphone. Once the sun goes down the pictures don't come out too well because there is no flash. I have a digital camera, but I can't manage to haul it around and transfer pictures. Not sure how this is any different, but still. Seems harder. So my point is, Steve Jobs, take note... We need a flash in the iphone camera and please don't come out with the new phone until my contract is up at AT&T and I can get the new version. Or better yet, send me a very fancy digital camera, like this, and I don't need a flash in my phone. Ok? Thanks! Here is a good food suggestioN: Vietnamese pho (noddles). Vegetarian. The veggies are great. Inexpensive.